Home/Blog / CosMedic Skincare is taking on Instagram! At Seattle CosMedic Skincare we are always striving to be at the forefront of technology. Our goal is to not only offer you cutting edge anti aging techniques and procedures, but to provide you with information as well. 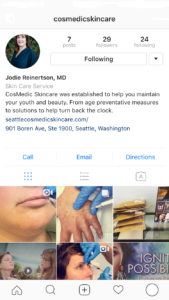 With that in mind Dr. Jodie, and the rest of the CosMedic Skincare family, has recently opened an Instagram account! Follow us @cosmedicskincare where we have begun posting informational photos and videos on everyone’s favorite procedures.